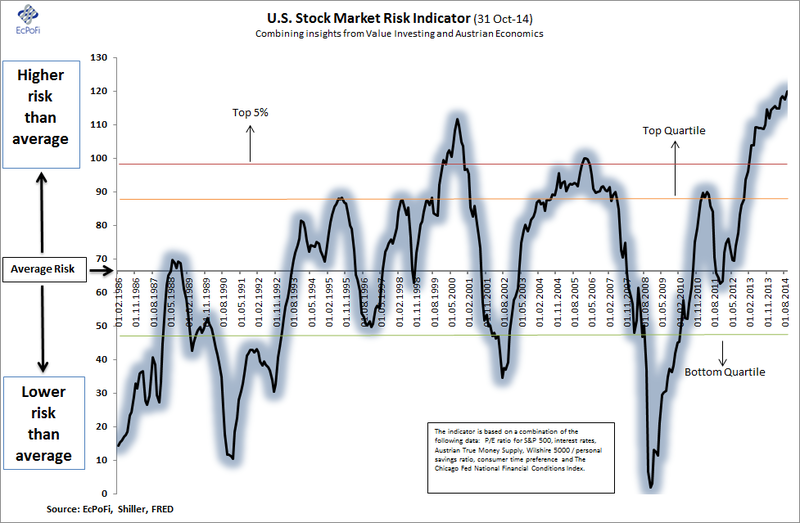 The U.S. stock market risk indicatorÂ climbed 2.1% during October to reach the highest level of risk ever recorded based on data starting in 1986. The index currently signals the probability of poor future stock market returns have never been higher during the period covered. Following a choppy slide during the first couple of weeks of October, the U.S. stock market turned around and ended the month with a gain of just under 2.3% taking the S&P 500 to a new record high. Higher stock prices leading to a yet higher P/E ratio combined with aÂ declining money supply growthÂ were major contributors to the increased risk added during the month.